Whether you are looking for a credit card that rewards you for everyday purchases, offers exceptional insurance benefits or helps build credit, the Energy CU is proud to offer you a credit card that does more for your financial picture. 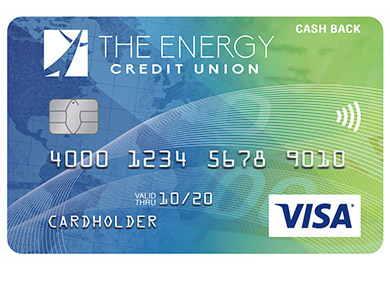 The Energy CU has partnered with Collabria, a cooperative company with unique payment solutions for credit unions, to provide a family of credit card options created specifically for Energy CU Members. Along with the convenience of acceptance nearly everywhere around the world, your Visa card includes a wide range of built-in benefits. You’re only responsible for purchases you’ve authorized on your Visa account. Online shopping is more popular than ever, and Verified by Visa gives you an extra layer of protection. By registering a password for your Visa card with the Verified by Visa service and shopping online at Verified by Visa enabled merchants, your card can only be used by you to make online purchases. Verified by Visa is available at no cost exclusive to Visa cardholders and helps prevent online fraud before it happens. Breeze through checkout faster with Visa payWave. Simply wave your Visa card in front of a secure reader and you’ll be on your way. No need to swipe. No need to sign. No worries about paying with cash. Visa takes protecting your account even further with Address Verification Services. By matching the address on your account with the address given when making a purchase, Visa works with merchants to cut down on fraud and help protect your account. Enjoy the peace of mind of emergency assistance virtually anytime and anywhere. Visa Global Service helps you with reporting a lost or stolen card, obtaining an emergency card replacement or receiving an emergency cash advance. Lost/Stolen Card Reporting — Lost or stolen credit cards can be a major source of fraud. But you can help protect your account against fraud by promptly reporting the theft or loss of your Visa card.